It's a bit of a hectic week this week, my Puddlers, but that doesn't mean I can't bring you some high quality podcasts as well as columns (hopefully). Today I bring you another installment of Puddles of My Podcast. In this, Episode 26 of Puddles of My Podcast, I welcome Miles Debas of Snakes Say Hiss and Paul Sicilian of the Tony Castles. 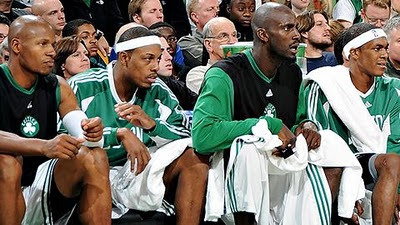 In this installment, Paul, Miles and I discuss the 2010-2011 Boston Celtics, Game 7 of the 2010 NBA Finals, and debate over the best storylines of the upcoming season. We also play a game of "thumbs up, thumbs down"; decide what movie you would take Kevin Durant too; and Paul and Miles each give us their all-time starting NBA starting lineup with some surprising results. This podcast is not for those weak of heart, or not interested in the NBA. Needless to say, I enjoyed this podcast very much and I recommend that you listen to it. Stay with me Puddlers, I got more coming.